Sara Just tells FBDC how NPR and PBS NewsHour came together on convention coverage. Everybody does it, PBS NewsHour executive producer Sara Just tells FishbowlDC, so PBS and NPR decided to give in to the popular misconception that the two organizations are one and cover the Republican and Democratic National Conventions as one joint jumble of acronyms. The real reason PBS NewsHour and NPR are partnering on convention coverage is that Just had her eyes on a partnership since she arrived at NewsHour in 2014. It is a pairing that made sense, given their shared sensibilities. “We both have a great many things in common–a commitment to covering the news with context, with depth, with integrity,” says Just, “and as public broadcasters we thought it made a lot of sense to try to combine forces in this way and to reach an audience from the car to the living room listening to this and watching online, on any device.” says Just. And so, for a portion of this month, the public radio organization and the public television organization will operate as one unit, NewsHour anchors and reporters coming together with NPR reporters to create one broadcast across the platforms. NewsHour and NPR are providing three hours of coverage each night of the convention, beginning at 8 p.m. ET, which will broadcast on both radio and television. 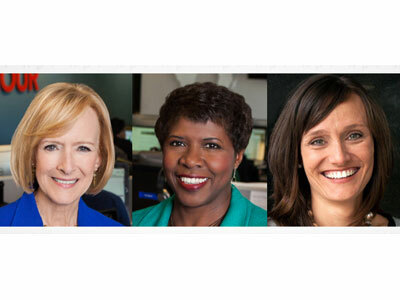 NewsHour co-hosts Gwen Ifill and Judy Woodruff will co-anchor the coverage with contributions from NPR’s national political correspondent Mara Liasson, Washington desk senior editor and correspondent Ron Elving and lead editor for politics and digital audience Domenico Montanaro, as well as NewsHour regulars Mark Shields, David Brooks and Amy Walter. Meanwhile, NPR host Rachel Martin will be the podium reporter and congressional reporter Susan Davis the floor reporter. NewsHour political director Lisa Desjardins will report with Davis from the floor of the Republican National Convention, and NewsHour correspondent John Yang will do the same during the Democratic National Convention. They’ll be other reporters and correspondents joining, some of whom are new to the politics coverage game. For Just, having the newbies there is just as important as making sure the seasoned vets are in place, a construction she compares to the audience composition. “We’ll offer insight of people who have been covering this for a long time as well as the eyes and ears of reporters who are new to covering it, just like many in the audience are new to watching it,” she says. “It will be a lot of time to really listen to the speeches, really listen to the presentations,” she says. Those three hours of nightly coverage will give them the space to do that.